This Striped sea snake is probably the most thoroughly oceanic of all snakes. A marvelously effective swimmer, its body has been restructured by a flattening of the tail and the formation of a ventral fold of skin, which allows it to swim like an eel. Seldom more than 3 feet in length, it is one of the smaller species of sea snakes. It gives birth to live young, which are born in the open ocean. Although it ranges across the Pacific it apparently prefers certain areas such as the intersection of currents off Colombia and Panama where hundreds of thousands of specimens have been observed. 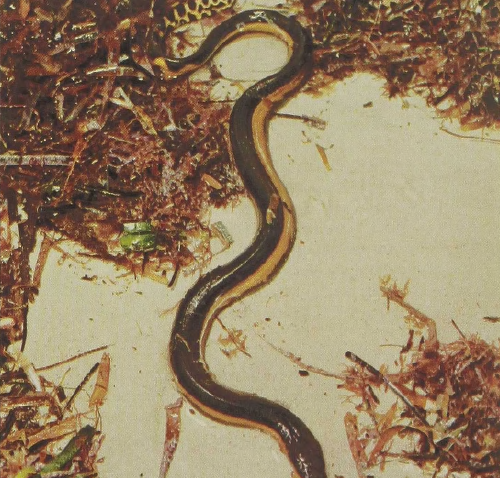 Locomotor specialization has proceeded to the point where these snakes have trouble moving on land or returning to the water if stranded by the tide. They feed on elongate fishes which they immobilize with an injection of strong nerve poison. Like all other snakes they periodically shed their skin which, in this case, also al lows them to clean off barnacles and other invertebrates that may temporarily settle on them. Indeed, they have developed a special cleaning movement for which they twist themselves into a knot and run the whole body through it so that a coil continuously scrapes all parts.